X-Labs has recently built a huge Dual Resonant Solid State Tesla Coil! This type of large DRSSTC uses advanced power electronics which allow the coil to be very efficient, compact, and controllable. While the coil is still in development, we have already used it it the 2012 USF Engineering Expo at very low power (we ran it at 5 foot arcs off of a regular power outlet...YES... that is LOW power for this coil!). During the second day at EXPO, we even had it playing music! Secondary: 1 foot diameter, 8 foot long pvc pipe wound with over a mile of 20awg magnet wire. Power Supply: 240v Variac connected to a voltage doubler - this gives several hundred volts across the bridge. There are also large capacitors across the bridge to supply huge amounts of current on demand. The coil can play music with the help of an external MIDI interrupter. The interrupter consists of an Arduino, Midi Shield from Spark fun, and a cheap USB to Midi cable from amazon. The interrupter signal is sent to the DRSSTC through a fiber optic cable. The signal is a simple square wave that is pulsed high to the frequency of the midi note that we want to play. Whenever the pulse is high, the coil is making an arc and thus making sound at the frequency of the note we want to play. This is how the coil plays music. 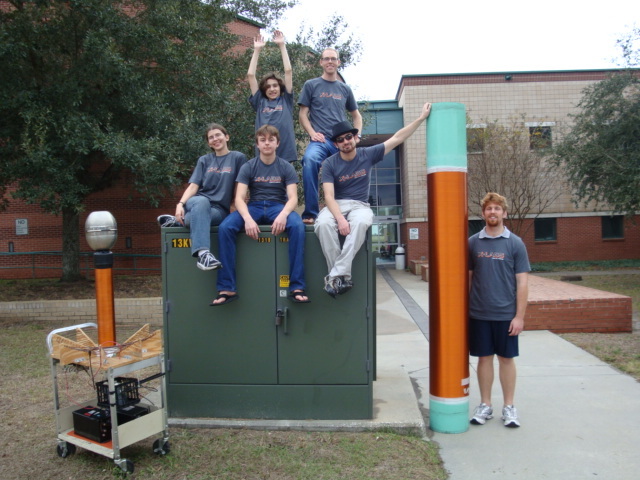 Once this big Tesla Coil is fully functional, it will be X-Labs most impressive demo yet! The Secondary Coil on it's completed base...this thing is MASSIVE!!! This is the Primary Coil completely wound (it's just copper tubing from home depot). The 4 CM600 IGBTs are also sitting on top of the base attached to the heatsink. This is the completely soldered UD2.1 DRSSTC driver. We ended up accidentally frying this board and had to buy and quickly ship a replacement from another Coiler just days before the 2012 Engineering EXPO. This is the heart of the Coil, the Full Bridge of IGBTs along with power supply capacitors (the big blue ones), the snubber capacitors (the 2 small square black ones), and the Gate Drive Transformer (the yellow CAT5 cable wrapped around the ferrite core). This is a picture of the electronics the night before the 2012 Engineering Expo. The main tank capacitor (the white capacitors) had to be reconfigured due to a problem with the design. The problem was actually that they were not big enough in capacitance. They were reconfigured for a higher capacitance but doing so lowered their voltage rating. With a lower voltage rating, they have the possibility of catastrophically failing if the coil is run at a high power level. This is the reason that we had to limit the coil to five foot arcs during Expo. We currently have new capacitors which are much larger. Once they are built into a sturdy capacitor bank for this coil, we will be able to run at maximum power! The picture below is the big DRSSTC being prepped for the EXPO show. The coil on the right is Coyt Barringer's little DRSSTC that also plays music. The one on the far left that is only half visible is our "Old Faithful" spark gap coil. Please stay tuned for more Big Tesla Coil updates! This coil is not yet finished, and we expect over 10 foot arcs out of it when it is complete. It is truly going to be EPIC, especially with music!